* Except if you are an invited participant. Please come to the General Reception at the event and register. Reception will open at 8:15- on March 16th, at 8:30- on 17th-19th. Pre-registration is not complete until (1) registration information has been submitted internally and (2) payment has been received. ■If you have already applied for your presentation : login to meeting's MYPAGE and register from "Make Registration". 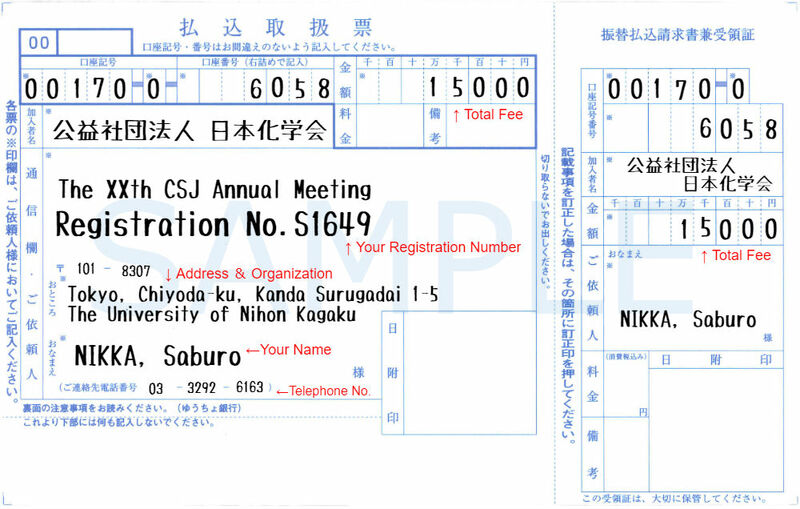 Use the meeting's original form which is attached in the "Kagaku-to-Kogyou (Chemistry & Chemical Industry)", or the transfer form in the post office. Don't forget to write your registration No. in the note. 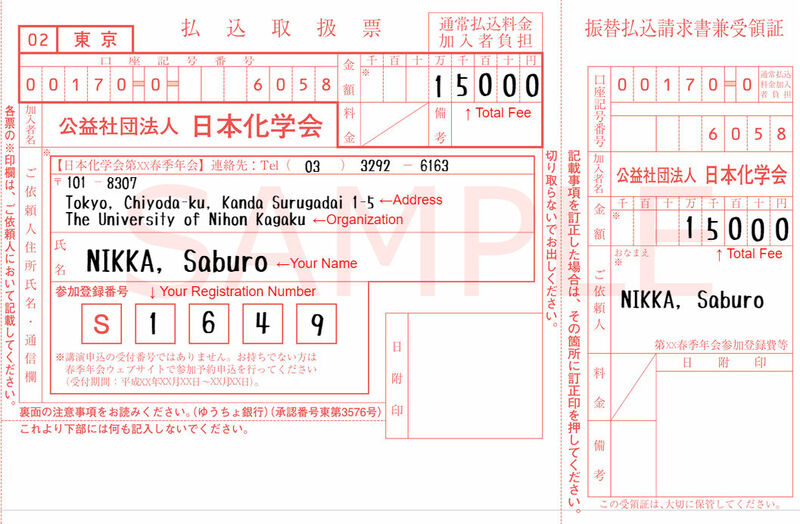 (1) Pre-printed forms attached in the "Kagaku-to-Kogyou (Chemistry & Chemical Industry)"
(2) Blank forms at post office counters *Postal transfer charges must be paid by the participant. Since we do not accept payment via overseas remittance, please contact us via E-mail by February 15th, 2019 [nenkai_at_chemistry.or.jp]. We will deliver your attendance certificate and collection of papers (DVD) in advance to the registrant who have completed their registration and payment until the deadline. Registrant who have completed their registration and payment until the deadline will be able to use the collection of papers in website. To use the collection of papers in website, you need your registration No. and registration password. You will also be able to use the collection of papers in website, after you have registered at door. Please note that we only ship documents in Japan. We cannot ship overseas and also we do not ship to freight forwarders. To receive your attendance certificate and collection of papers (DVD), please come to General Reception at the event venue.